It Takes Just a Little to Give Back a Lot! Richmond County’s Community Food Drive is happening now! AARP Virginia and organizations across Virginia are calling on communities to help supply the state’s food banks during a statewide community food drive September 8-15, 2013. As more families struggle to make ends meet, Virginia’s food banks need help feeding hungry people. You can help right here in your own community by participating in the AARP Community Food Drive on September 8-15. AmeriCorps, Urban League of Hampton Roads, Northern Virginia Urban League, Warsaw-Richmond CountyTriad and the Virginia Federation of Food Banks also are assisting with the food drive effort this year. In times like these, demand for help from local food banks is rising. 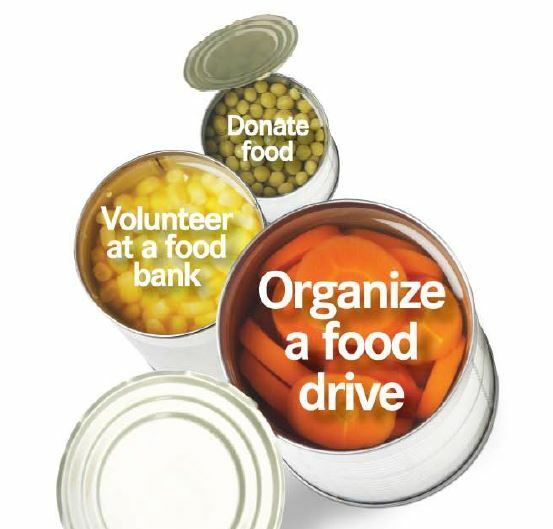 You can help hungry families by participating in the AARP Community Food Drive. Virginia food banks and their partner agencies are experiencing daily increases in demand for assistance due to rising unemployment, higher food prices and a slow economy. You can make a difference in Richmond County September 8-15 by filling a bag with non-perishable food that our local food pantries needs most. Those items include: peanut butter, chunky soups, canned meats, canned tuna, canned vegetables, crackers, hot and cold cereal, pasta, rice and canned fruit. No glass containers, please. Richmond County collection sites include Farnham Manor, The Orchard, Richmond County Social Services, and the Town Hall. On Tuesday, September 10, Warsaw United Methodist Church food pantry will be open from 9 to 5 for donations, as well. In addition, Visiting Angels at 67 Irvington Road in Kilmarnock has volunteered to be a collection point, because they serve so many elderly in Richmond County. Additionally, a list of food collection sites is available at www.CreateTheGood.org/va or by calling 2-1-1. The list will be updated regularly. This entry was posted on September 9, 2013 by jabercrombie702.